The Korean war started in 1950 and although the fighting stopped with the 1953 armistice, recent tensions on the Korean Peninsula are once again drawing attention to this part of the world. A North Korean soldier looks through the window of the building that sits on the Demilitarized Zone (DMZ) in Panmunjom, South Korea, that separates the two Koreas, July 21, 2010. The Korean war started in 1950 and although the fighting stopped with the 1953 armistice, recent tensions on the Korean Peninsula are once again drawing attention to this part of the world. <br><br> A North Korean soldier looks through the window of the building that sits on the Demilitarized Zone (DMZ) in Panmunjom, South Korea, that separates the two Koreas, July 21, 2010. “If North Korea were to dramatically implode, most analysts expect a wave of refugees headed toward China, South Korea or even Japan,” Robert Kelly, an associate professor of political science at Pusan University in South Korea, wrote in an email to ABC News. The refugee flow could be “on the same scale as Syria but perhaps with even greater desperation.” <br><br> Thousands fled the battle zones when the North Korean communist army, backed by the Soviet Union, crossed the 38th Parallel and invaded South Korea on June 25, 1950. The battle of Inchon was an amphibious invasion that was a decisive victory for the U.N. and American troops in the early months of the Korean War. <br> <br> U.S. Marines in a naval landing craft arrive at the port with the battle raging in the background. The operation involved 75,000 troops and 261 naval vessels. Gen. Douglas MacArthur was the commander of both the U.N. and U.S. forces -- known as the United Nations Command (UNC) -- and he accompanied U.S. troops on their invasion of Inchon harbor, keeping in close touch with the fighting soldiers as they drove inland. Just five years earlier in 1945, MacArthur accepted Japan’s surrender in WWII aboard the USS Missouri. North Korean troops were able to capture the city of Seoul within three days of their invasion and continued to push southward. <br><br> An elderly resident of Seoul walks through one of the streets in the capital city, destroyed during bitter fighting between South Korean forces and North Korean troops. U.S. Marines recaptured Seoul within two weeks of landing at Inchon. <br><br> An American soldier engages North Korean soldiers as others duck for cover during street combat in the Korean War. The Department of Veterans Affairs put the U.S. Battle Deaths at 33,739 and “other deaths in theater” at 2,835. There are still 7,800 U.S. soldiers still unaccounted for according to the U.S. Defense POW/MIA Accounting Agency. <br><br> An American soldier comforts a fellow infantryman whose close friend had been killed in action in the Haktong-ni area, Korea, August 1950. A corpsman fills out casualty tags in the background. After the end of WW II and the surrender of Japan, Kim Il Sung returned to Korea to establish a communist provisional government, becoming the Communist leader of North Korea in 1948. Kim, seen at right in the front row, is shown with a group of uniformed Russian advisers in November 1950. The Korean Truce was signed on July 27, 1953. The armistice was designed to “insure a complete cessation of hostilities and of all acts of armed force in Korea until a final peaceful settlement is achieved." It was not a peace treaty and a state of war still technically exists between the two Koreas. <br><br> During the Panmunjom cease-fire talks on Oct. 11, 1951, Col. James Murray Jr., of the U.S. Marines, and Col. Chang Chun San, of the North Korean Communist Army, initial maps showing the northern and southern boundaries of the demarcation zone. China has long played a vital role as one of North Korea’s closest allies. The Sino-North Korean Mutual Aid and Cooperation Friendship Treaty pledging friendship, cooperation and mutual assistance was signed by the leaders of China and North Korea. Chinese Premier Zhou Enlai, left, appears with Kim Il Sung of Communist North Korea, who waves to the crowds after arriving in Beijing on an earlier state visit in November 1958. On Oct. 24, 1952, while running for president, Dwight D. Eisenhower pledged in a campaign speech to personally visit Korea. “There is a Korean War, and we are fighting it for the simplest of reasons; because free leadership failed to check and to turn back Communist ambition before it savagely attacked us.” <br><br> President-elect Eisenhower travels in a motorcade in South Korea in December 1952. Throughout the years, massive, colorful parades have become the stage for the North Korean military to show off its military might. Intelligence and security analysts study the videos and photographs for insights to North Korea’s missile program. The parades are attended by thousands of North Korean citizens and members of the military.<br><br> Pyongyang citizens parade to celebrate the 15th anniversary of the founding of North Korea in Kim II Sung Plaza, Sept. 9, 1963. Officers and crew of the United States Navy ship USS Pueblo are led away after being captured by North Korean forces on Jan. 23, 1968. The Navy intelligence ship and 82 surviving sailors were taken to the port of Wonsan and moved twice to POW camps. The crew, upon release eleven months later, spoke of being tortured during their imprisonment. The USS Pueblo, shown here in August 2007, is docked along the Taedong River in Pyongyang, the nation's capital, and has been turned into a museum and tourist attraction. The ship is still considered and listed as a commissioned U.S. Naval vessel. Throughout the years, the U.S. government has made attempts get the USS Pueblo back, but to no avail. Two American officers, Arthur Bonifas and Mark Barrett, were killed when North Korean soldiers attacked members of the UNC (United Nations Command) with axes near checkpoint No. 3 in the JSA of the Korean DMZ, Aug. 18, 1976. They had been trimming the branches of a poplar tree in the DMZ when the incident took place. Three days later, American and South Korean military forces returned to the site unannounced and in an overwhelming display of force, cut the tree down, surprising their North Korean counterparts who could only stand and watch. One of the few places along the DMZ in which military officers from both sides can sit across a table, look each other in the eye and speak to each other, is the Joint Security Area (JSA) in Panmunjom near the 38th parallel. The JSA has been used for diplomatic engagements and military negotiations between North Korea and the United Nations Command (UNC). <br><br> American and South Korean delegations, at right, talk to their North Korean counterparts inside one of the buildings at the JSA, in the DMZ, February 1988. The border runs down the middle of the table. “The Great Leader,” Kim Il Sung, left, with his son, Kim Jong Il, inspects a soccer ground in Pyongyang in 1992. Kim Jong Il, who became known as “The Dear Leader,” succeeded his father after his death in 1994. Conflicts between the two countries are not just on land as the seas off of the Korean coast have also been the scene of disputes between the countries Naval forces. Forty-six South Korean sailors lost their lives when their patrol boat, the Cheonan, was split in two by an explosion on March 26, 2010. South Korean military intelligence claimed that a North Korean torpedo sank the ship. <br><br> A giant floating crane lifts the Cheonan out of the water to place it on a barge on April 15, 2010. By the late 1980s, U.S. analysts believed North Korea was trying to build a nuclear bomb. Former President Jimmy Carter visited North Korea in 1994 and met with Kim Il Sung, helping to defuse tensions and paving the way for the 1994 Agreed Framework. As part of the agreement, North Korea agreed to give up their pursuit of nuclear weapons in exchange for aid with the country’s energy shortage. By 2002, U.S. intelligence became convinced that the North Koreans were pursuing an enrichment program, and by 2003, the agreement had fallen apart. General Raymond Davis, President Bill Clinton, and South Korean President Kim Young Sam stand alongside the Korean War Veterans Memorial during the 1995 dedication ceremony in Washington, D.C. The memorial commemorates the sacrifices of the 5.8 million Americans who served in the U.S. Armed Services during the three-year period of the Korean War. Famine and food shortages in North Korea have been common throughout the country’s history due to weather, lack of good farmland and the government’s economic policies.<br><br> Dock workers unload a shipment of American wheat at the port of Hungnam. The arrival of 100,000 tons of U.S. wheat in May 1999 allowed the United Nations World Food Program to increase its rations for primary schoolchildren and the elderly for May and June -- the hardest months of the year in North Korea's famine. More than 70 percent of the population of North Korea – or 25.16 million people – suffer from food insecurity and a quarter of children under the age of 5 suffer stunted growth due to malnourishment, according to a report from the United Nations World Food Program. <br><br> Three-year-old North Korean, Jong Song Chol, is fed a vitamin and mineral-enriched porridge supplied by the UN World Food Program at a hospital in Sinyang County on Aug. 4, 2004, in South Pyongyang Province, North Korea. Promising "to broaden understanding between North and South Korea," South Korean President Kim Dae Jung traveled to Pyongyang in June of 2000 and met with North Korean President Kim Jong Il. It was the first time that leaders from the two countries had met face to face. <br><br>South Korean President Kim Dae-jung, left, and North Korean leader Kim Jong Il hold hands as they sing, "Our dream is reunification." The two met for a three-day summit in June of 2000. In an attempt to end North Korea's isolation and remove the threat of war in one of the world's most volatile regions, Secretary of State Madeleine Albright flew to Pyongyang to meet with the North Korean leader. <br><br>North Korean leader Kim Jong Il, left, toasts U.S. Secretary of State Madeleine Albright at a state dinner in Pyongyang, Oct. 24, 2000. Officials of the Korean Peninsula Energy Development Organization (KEDO) place the first concrete in the foundation for a nuclear reactor in the Light Water Reactor project, created under the so-called Agreed Framework. It was signed by Pyongyang and Washington in 1994 at Kumho on North Korea's northeastern coast, Aug. 7, 2002. China, Japan, North Korea, Russia, South Korea and the U.S. made up the Six Party Talks established in 2003 to de-nuclearize the North Korean weapons program. The talks ended in 2009 after North Korea attempted to launch a satellite which crashed into the Pacific Ocean. North Korea, citing the talks as "useless," announced the next day that it would no longer be a part of the talks and would resume its nuclear weapons program.<br><br>U.S. Assistant Secretary of State Christopher Hill, far left, joined other representatives who make up the members of the Six Party Talks, July 26, 2005. In an unprecedented cultural exchange between the United States and North Korea, a country President George W. Bush had labeled as part of the "Axis of Evil" six years earlier, members of the North Korean audience listen to the New York Philharmonic orchestra during its inaugural performance in Pyongyang on Feb. 26, 2008. North Korea's Workers' Party newspaper, Rodong Sinmun, released a photograph that showed Kim Jong-un, left, posing with his father, then-leader Kim Jong-il, in an unspecified location. 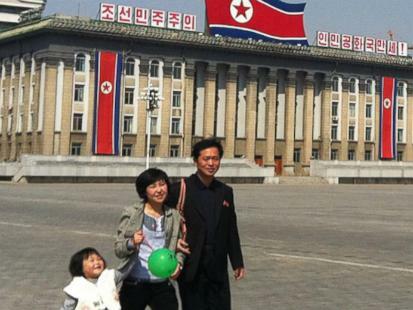 The photograph is believed to have been taken shortly after January 2009, when the younger Kim was designated as Kim Jong-il's heir apparent. Former U.S. President Bill Clinton made a surprise visit to North Korea in 2009 as a private citizen and within 20 hours won the release of Laura Ling and Euna Lee, two jailed American journalists. Clinton dined with reclusive leader Kim Jong Il and sat for a picture with Kim in this photo released by North Korean official news agency KCNA. North Korean leader Kim Jong Il, left, and his son and future leader, Kim Jong Un, review a military parade marking the 65th anniversary of the founding of the ruling Workers Party of Korea in Pyongyang, Oct. 10, 2010. It has been noted that Kim Jong Un strongly resembles his grandfather, Kim Il Sung. Because of ongoing threats from North Korea, South Koreans participate in many civil defense drills throughout the year. Elementary school students wear gas masks during one of those drills at a shelter in Seoul on March 15, 2011. Kim Jong Il died of a heart attack on Dec. 17, 2011, while traveling on a train outside of Pyongyang. He had ruled North Korea for 17 years after taking the mantle of leadership from his father, Kim Il Sung, the founder of North Korea. <br><br> Kim Jong Un salutes as he walks beside the hearse carrying his father’s coffin in Pyongyang on Dec. 28, 2011. 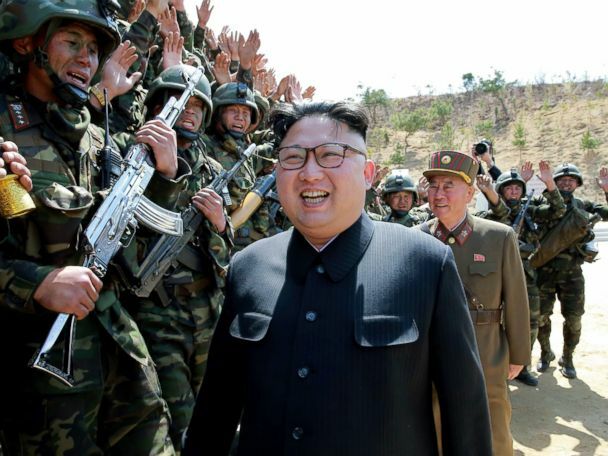 The younger Kim's uncle and presumed guardian, Jang Song Thaek, a vice chairman of the National Defense Commission, is behind him. Jang was convicted of treason in 2013 and executed. On April 5, 2009, North Korea attempted to put a satellite into orbit, but the mission failed and the rocket fell into the Pacific Ocean. Security analysts believed this was yet another attempt for North Korea to test its rocket program. The launch prompted the UN National Security Council to go into emergency session and issue a statement condemning the action.<br><br>A photograph of the launch hangs at the Three Revolutions exhibition hall in Pyongyang, North Korea. In an effort to send messages to citizens of North Korea, defectors now living in South Korea launch balloons near the border and watch them float across the DMZ into North Korea. The payloads will range from propaganda leaflets, condemning the leader, Kim Jong Un, to winter clothing for babies and young children.<br><br>Balloons carrying propaganda leaflets denouncing North Korea's nuclear test at Imjingak are launched near the DMZ on Feb. 16, 2013, in Paju, South Korea. A North Korean soldier points his camera at U.S. Secretary of Defense Chuck Hagel, left, as he photographs him through a window at the Joint Security Area that sits on the border of the DMZ in Panmunjom, South Korea. During his September 2013 visit, Hagel made clear that the U.S. was not contemplating any reduction of its military forces in the area. His visit was timed to be part of the celebrations marking the 60th anniversary of the armistice that aimed to, "insure a complete cessation of hostilities and of all acts of armed force in Korea until a final peaceful settlement is achieved." A photograph showing a night time view of the Korean Peninsula made from the International Space Station, Jan. 30, 2014. Unlike daylight images, city lights at night illustrate dramatically the relative economic power and importance of cities, as gauged by relative size. North Korea is almost completely dark compared to neighboring South Korea, lower right, and China at left. Pyongyang, the capital of North Korea, is the small light in the center of this photo, while Seoul, the capital of South Korea, is the large cluster, center right. The Korean Central News Agency was established in 1946 and is the central vehicle in which news about North Korea is disseminated for foreign consumption. Considered propaganda by western news agencies, the KCNA releases photographs that serve to highlight the message that North Korea is attempting to send and its Twitter feed carries images that frequently show a smiling, happy Kim Jong Un.<br><br> North Korean leader Kim Jong Un smiles during a visit to the Chonji Lubricant Factory in this undated photo released by the KCNA in Pyongyang on Aug. 6, 2014. Tour groups visiting the Joint Security Area of the DMZ are allowed to visit the site but visitors must adhere to a strict dress code as well as sign a document stating, “The visit to the Joint Security Area at Panmunjom will entail entry into a hostile area and possibility of injury or death as a direct result of enemy action. "<br><br> A South Korean and U.S. soldier, foreground, standing at the military demarcation line separating North and South Korea within the JSA and watching North Korean soldiers on Nov. 1, 2014, in Panmunjom, South Korea. Kim Jong Il was said to be a big fan of the NBA and Chicago Bulls and appears to have passed his love of the game to his son.<br><br>Former Chicago Bulls star Dennis Rodman, right, and North Korean leader Kim Jong Un chat while watching an exhibition basketball game between American and North Korean players at the Pyongyang Indoor Stadium on Jan. 8, 2014. Kim's wife Ri Sol Ju is seen sitting next to Kim. The game was held to celebrate Kim's birthday. Many Korean families were separated when the Korean War began and have gone for decades not knowing the condition of their loved ones. A family reunion program organized by the two countries has been hosting face-to-face reunions where family members can meet while officials from North and South Korea observe. For many divided families, this will be the last time that they will see each other. <br><br> North Korean Ri Mun-Woo, left, holds the face of her brother, South Korean Lee Cheon-Woo, as they bid farewell following their family reunion on Oct. 22, 2015, in Mount Kumgang, North Korea. Thousands of brightly colored ribbons adorn the barbed wire fence at the Imjingak Peace Park at the South Korean border city of Paju near the Demilitarized Zone on Jan. 1, 2016. The ribbons have messages written on them ranging from family members honoring their relatives who are still in the North, to wishes for a peaceful re-unification of the Korean Peninsula. North Korea has a record of detaining American citizens on charges ranging from illegal entry into the country to espionage to "hostile acts. "<br><br>Otto Frederick Warmbier cried and bowed at a press conference on Feb. 29, 2016 after he was arrested on Jan. 2 for allegedly committing "an anti-state, hostile act"— stealing a propaganda poster from his hotel. He was sentenced to 15 years of hard labor, but the U.S. State Department announced his release on June 13, 2017. He died on June 19, 2017, six days after returning to the United States in a coma. A South Korean honor guard carries the boxes containing the remains of 15 South Korean and two American soldiers killed inside North Korea during the war. The joint repatriation ceremony was held at Knight Field at Yongsan garrison in Seoul on April 28, 2016. There have been several of these ceremonies throughout the years, including one which was held at the Joint Security Area in 2012. At this ceremony three North Korean Army officers were allowed to step over the demarcation line to inspect the remains of North Korean soldiers before they were passed across to North Korean honor guards. In the shadow of the Hushan section of the Great Wall of China, a fence marks the North Korean-China border on an island in the Yalu River near the North Korean town of Sinuiju and the Chinese border city of Dandong. China has been re-enforcing the fence over fears of an influx of refugees fleeing North Korea. North Korean leader Kim Jong-un is seen talking to scientists and technicians involved in nuclear weapons research at an undisclosed location in North Korea in an undated photo released by the Korean Central News Agency. North Korea claims it has developed the technology to fit a nuclear warhead on a missile. The device in the picture, jokingly referred to by some as "the disco ball," could be a model based on a real nuclear weapon design. On April 18, 2017, the U.S. Pacific Command announced that the USS Carl Vinson Strike Group was heading to the Western Pacific. The nuclear powered aircraft carrier, surrounded by U.S. and South Korean support vessels, patrols in the Western Pacific Ocean on May 3, 2017. On May 15, 2017, the UN Security Council strongly condemned North Korea's latest ballistic missile test and vowed strong measures, including more sanctions, to derail Pyongyang's nuclear weapons program. Pyongyang said the new weapon, called the Hwasong-12, was capable of carrying a "heavy nuclear warhead. "<br><br> North Koreans gather at a street-side newsstand in Pyongyang, reading a copy of the Rodong Sinmun newspaper featuring coverage of the May 14 North Korean rocket test. This picture taken on July 4, 2017 and released by North Korea's official Korean Central News Agency (KCNA) on July 5, 2017 shows the successful test-fire of the intercontinental ballistic missile Hwasong-14 at an undisclosed location. Kim Jong-un, center, during a briefing by scientists at the Nuclear Weapons Institute on the details of the country's nuclear weapons program. The North Korean leader inspected what was said to be a hydrogen bomb that could fit into an ICBM missile. Unified Korea's flagbearers, North Korea's ice hockey player Hwang Chung Gum, left, and South Korea's bobsledder Won Yun-jong, lead the Unified Korea's delegation as they parade during the opening ceremony of the Pyeongchang 2018 Winter Olympic Games, Feb. 9, 2018. North Korean leader Kim Jong Un, left, takes the hand of South Korean President Moon Jae-in as the two cross the military demarcation line to the north side upon meeting for the Inter-Korean Summit April 27, 2018 in Panmunjom, South Korea. President Donald Trump speaks at Joint Base Andrews outside of Washington, D.C., after he welcomed home the three Americans that were detained in North Korea. From left, Tony Kim, Trump, Kim Dong Chul and Kin Hak Song. U.S. Secy of State Mike Pompeo stands in the background, May 10, 2018. Standing before North Korean and American flags, North Korean leader Kim Jong-un shakes hands with President Donald Trump during their historic U.S.-Democratic People's Republic of Korea summit at the Capella Hotel on Sentosa island on June 12, 2018 in Singapore. Members of the United Nations Command Honor Guard move 55 cases of remains, returned by the Democratic People's Republic of Korea, from a C-17 Globemaster III during a repatriation ceremony at Osan Air Base, Republic of Korea, Aug. 1, 2018. The Associated Press reported that the handover follows through on a promise North Korean leader Kim Jong Un made to President Donald Trump when the leaders met in June and is the first tangible result from the much-hyped summit. Trump welcomed the repatriation and thanked Kim in a tweet. A closer look at the North Korean leader.